Myth and mayhem inhabit a richly reimagined New Orleans in this sequel to Darkness Becomes Her. Once again, Ms. Keaton delivers at atmospheric story rich with vivid detail, careful worldbuilding, and heart-in-your-throat stakes. I ached with Ari as she struggled to learn how to use her power without becoming the monster she was created to be. I stayed up waaaay too late as each plot twist kept me desperately turning pages to see what would happen next. And the ending left me wanting more! This is a fabulous series, beautifully written, and any reader who loves mystery, magic, mythology, and a story where misfits find redemption should give it a try. A Beautiful Evil by Kelly Keaton was a delightful book that really stood up to its predecessor, Darkness Becomes Her. With it's enticing plot and cool play on mythology, A Beautiful Evil is sure to be a favorite! I enjoyed the book book in this series, Darkness Becomes Her, but I wasn't absolutely blown away by it. A Beautiful Evil builds upon the foundation Darkness Becomes Her sets and explodes into a story that was just awesome. The stakes are high, there is action, and there is so many pieces to try to fit together to discover answers. I loved it! I continue to love the characters of this series. Some characters who played a smaller role in Darkness Becomes Her have a more involved part in A Beautiful Evil and you really learn more about them and their pasts which was neat. Ari is such a strong main character, which is awesome. I really enjoyed A Beautiful Evil. Kelly Keaton has put such an interesting twist on mythology and has woven it into a paranormal story. 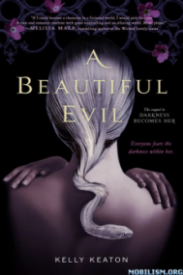 A Beautiful Evil was addicting - I didn't want to put it down! A Beautiful Evil, is the sequel to Darkness Becomes Her. The book is even better than the first. But, you can just feel that Kelly Keaton used the sequel to prepare us for the big bang of the third in the series. Throughout the whole book, I kept rooting for Sebastian and Ari. Sebastian and Ari both learned some pretty interesting things about themselves, I can't wait to see what the next book will reveal, and how their relationship will develop. The action is suspenseful, yet ever-present. The romance was just blooming and has so much more potential, but in a good way. All of the characters seem to be dynamic, always changing, and always keeping you on your toes.